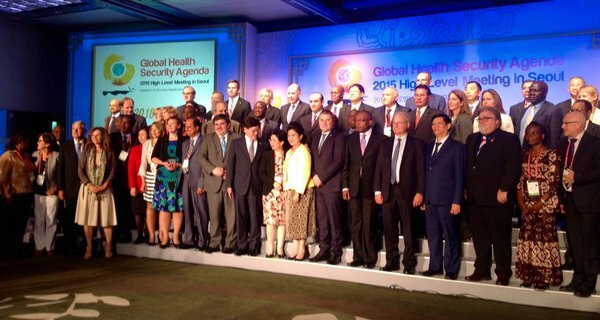 Today marks the third anniversary of the Global Health Security Agenda (GHSA) that was launched exactly three years ago on 14 February 2014 “to advance a world safe and secure from infectious disease threats, to bring together nations from all over the world to make new, concrete commitments, and to elevate global health security as a national leaders-level priority”. Throughout the past three years, a significant number of concrete commitments for building national capacities have been made by over 50 countries, as well as donors and other partners. The 11 Action Packages agreed upon by GHSA countries form a framework for commitments that are transforming into action and increased capability in many countries, especially in those with the highest risk. The GHSA has been influential in strengthening collaboration across sectors and in linking together relevant global processes as well as fostering collaboration between different actors. It has played a central role in bringing health security more prominently on the political agenda and in opening new paths for cooperation in the sphere of health security. One of such paths is the work on evaluation of countries’ capacities. In 2015, the GHSA steering group developed a method to independently assess the health security of each country. The method was piloted in six countries in 2015. The results were encouraging, and the method contributed to the WHO’s process of developing the Joint External Evaluation (JEE). Since WHO adopted the JEE process and tool in February 2016, 29 missions have been carried out in six regions. Dozens of JEEs have been scheduled for 2017 and 2018. The process of ensuing work on country planning has also moved forward, with Tanzania and Pakistan already having draft national plans in place. The need to support the broadening scope of work to strengthen global health security resulting from tremendous interest in the external evaluations initiated the JEE Alliance. The Alliance serves as a platform to discuss, exchange views and build networks among stakeholders involved in health security, in particular with a view on long term capacity building. The main focus is to support multi-sectoral collaboration that strengthens countries’ health security, including by making the results public and storifying the progress. WHO, FAO, OIE, the World Bank, and other international organizations, as well as the non-governmental and private sector all play a critical role. During these three years, we have seen a tremendous development in the field of health security, which now involves a multitude of actors with genuine commitment to strengthening countries’ capacities to prevent, detect and respond to health threats and hazards with health consequences. Much remains to be done to enhance the coordination of efforts and sustainable, long-term capacity building. The GHSA and JEE Alliance demonstrate two distinct but interlinked platforms that bring actors together. Finland as the Chair of the JEE Alliance is committed to contributing and collaborating through both GHSA and JEE Alliance to enhance health security. The pace of progress demonstrated in health security capacity building since 2014 encourages us to continue our efforts together with all partners.